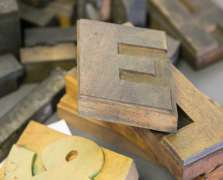 After a bit of break, we’re delighted to continue our A-Z of DCA Print Studio, taking you through the alphabet and giving you a bit of insight into what goes on in our Print Studio. Kicking off where we last left things, here’s the letter I for 'ink-credible' inks! Inks are to a printmaker as paint is to a painter and there are many similarities between the two as you’ll see as you read on. In this story, we’re giving just a brief overview of the types of inks that are most commonly used in DCA Print Studio. You could go much deeper into the subject and there are plenty of books on ink - if you're interested our Print Studio tutors will be happy to give you some recommendations. Traditionally, printmakers mixed their own inks, using pigment and an oil such as linseed oil. This involved grinding the two together using an instrument called a muller. This is a lengthy process and it’s not something that most modern-day printmakers do, as commercial inks have good pigmentation and are widely available. There are times when mixing and grinding your ink can be part of the overall activity though, such as in our Japanese Brush Calligraphy course, where you’ll perform a meditative ink-grinding ceremony. Intaglio inks: Intaglio is a type of printmaking where the image is incised in the surface, and the incised or sunken line holds the ink – like in Etching. These inks are oil-based and are similar in consistency to oil paint. Litho-relief Inks: these inks are similar to Intaglio inks, though they have a stiffer consistency. They can be used for practices such as Wood Engraving, or anything that uses a relief surface. Relief Printing Acrylic Water based: similar to above but water-based – so a slightly looser consistency (and easier to clean!). Watercolour Mono Printing: For our popular Watercolour Mono Printing (plus Chine-Collé) course we simply use basic water-colour paint. These achieve the wash affect and painterly line required - you might recognise these paints from your childhood! Screen Printing: for Screen Printing we use acrylic inks, which are very similar to (and interchangeable with) acrylic paints. In the Print Studio we tend to use a kind called System 3 for basic printing, our classes and tests, and one called Lascaux for the finished products - it's used for many of the works in our Editions programme. We also have metallic paints in a cupboard for special use – look at the gold-dust (pictured)! This would give your work a pretty gold shimmer. These specialist paints cost a wee bit more money than your Print Studio usage fee covers, so just ask a member of staff if you’re interested in trying them out. Riso printer: our vintage Riso printer is used in Riso Printing (faux CMYK) and also Zine Printing. The ink used is soy-based and environmentally friendly – which is always nice. Riso printers look like a photocopier, but they print in layered fashion that is similar to the method used in screen printing. Akua ink: This is a water-based ink that is used for fine detail – it’s really good quality, and we will often use it in our Takuhon class (there's no Takuhon in this Get Creative guide, but check in again next season as it will return). If you spotted the photocopier in our Print Studio, you may have understandably thought it was for admin work - but it’s actually there as the black in a photocopier is 100% opaque, so it works really well for Screen Printing. (And yes, occasionally it gets used for the odd bit of admin too!). 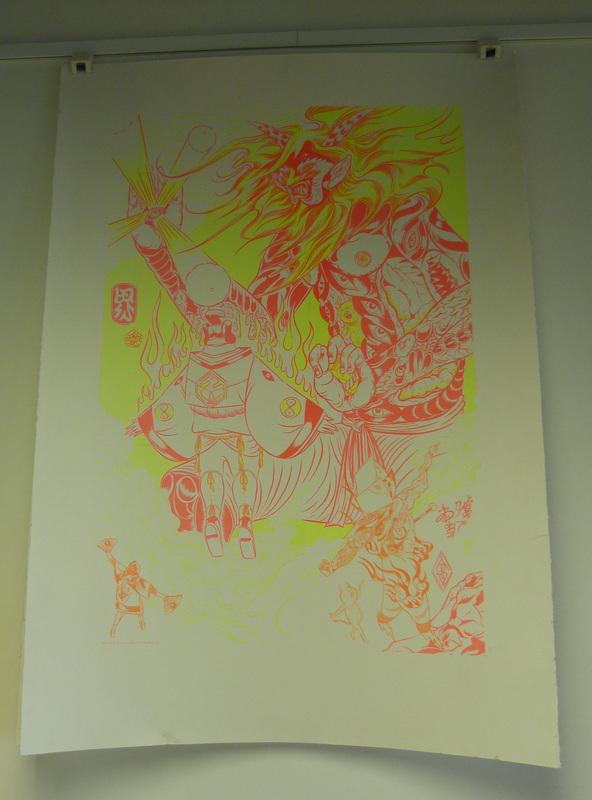 And now for something completely different: this Hideyuki Katsumata edition is printed in black light ink – so it looks completely different under the black light! Intrigued by what you see? Book yourself a place on one of our Print Studio Tours to learn more and get an introduction to the Print Studio. Or have a browse through out Get Creative guide for many of the courses mentioned above – there are loads on offer for beginners and experienced artists alike!